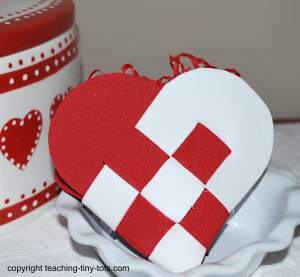 Using two different colors of foam to weave this cute little heart. 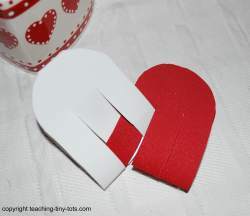 Fill with small candies and stickers to make it a Valentines gift. Print out the pattern. Adjust to size desired. Larger is easier to work with. 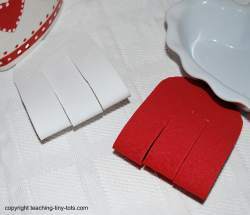 First cut out rounded rectangle shape from the paper or foam. Fold the foam in half. 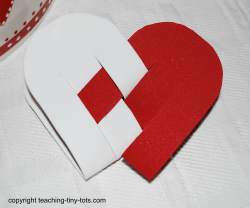 Fold the pattern in half and place on foam. Using the pattern as a guide, cut two slits making sure to cut no further than the pattern. Weaving: You will be weaving through and around the strips rather than the over and under in traditional weaving. Place one folded piece on the left and one on the right. Now make that strip (red) go around the middle strip on the left (white). The middle strip on the left (white) will go through it. Now take the second strip on the right (red), and put it around the first strip on the left (white) and then through the middle left strip. The third strip (red) will follow the same pattern as the first one you did. Keep going through and around until you've done all the strips. If you'd like a handle, cut a strip of foam and use craft glue to attach it inside the front and back of the basket. 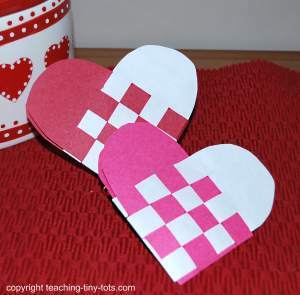 For classrooms, use construction paper to make these hearts. Best to do in small groups of 2-3 students or with parental assistance. These are a little tricky to make. A larger size heart will be easier to assemble.